Bradford's highly anticipated 2nd instrumental rock album! GREAT album featuring beautifully crafted compositions, insane lead guitar work, and lush sound! Do it RIGHT and get this album! Bradford is a professional in the aerospace industry. While Bradford has a passion for science and technology, he also has another passion that runs just as deep, which is music. A lifelong musician, Bradford began playing the guitar as an early teen and quickly outpaced all of his instructors. For many years thereafter, Bradford played in numerous bands covering primarily top 40 rock, hard rock/ heavy metal, and original indie rock styles, and released three CDs. Having tired of the demands of constantly performing by the mid ‘00s, Bradford turned his attention to composing original music and built a home studio. In the studio, Bradford brought the rigor of scientific discipline to the recording process while maintaining the essential “Bradford” feel and style for which he is known. Bradford’s goal was to produce an album of songs that would “sing without singing.” In the studio, Bradford uses no other musicians, and is involved in every aspect of the production. Drums are loop performances, or programmed, and all other instruments (bass, keyboards, and guitars) are played live. Bradford’s close attention to detail ensures that every aspect of a song is well structured, great sounding, and reflects his musical vision in the closest possible way. In addition, Bradford also mixes his own albums, and only relinquishes the mastering process to another studio. With his debut solo album, “The Ninth Ring,” Bradford proved that with modern technology, a musical vision, and a lot of hard work, one man can produce great results. The album was well received and garnered favorable reviews among instrumental rock genre fans. 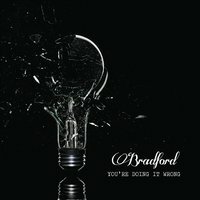 Bradford's second album "You're Doing it Wrong" to be released in the summer of 2016. Written and recorded over a period of nearly 2 years, "You're Doing it Wrong" steps up the game by bringing exceptional sonic quality and superior musicianship to the party. Each track carefully hand crafted, instrumental rock has never sounded better.